Whether you’ve decided to combat the signs of aging or you just want to see the world more clearly, you’ve decided on a more confident you through cosmetic eyelid surgery. Now what? Who goes on this journey with you, and what can you expect? A cosmetic eye procedure shouldn’t be a guessing game; you should feel confident and relaxed, knowing that you’re in the best of hands, and that all your questions have been answered. Use our guide as a checklist, and know that you’ve made an informed decision. -How many years of training did you receive? -How many times have you performed this procedure? Over how many years? -Are there any alternatives to this procedure? -Who will assist with the procedure? What are their qualifications? -Where will the procedure be performed? -What exactly does the procedure involve? -Do you have hospital privileges? Where? -What type of anesthesia will be used? -How long will the procedure last? -How long will the effects of sedation last? -How long will it take to recover? -What will be expected of me to get the best results? -What are the risks associated with the procedure? -What options do I have if I’m dissatisfied? -What warning signs can I look out for after the procedure? 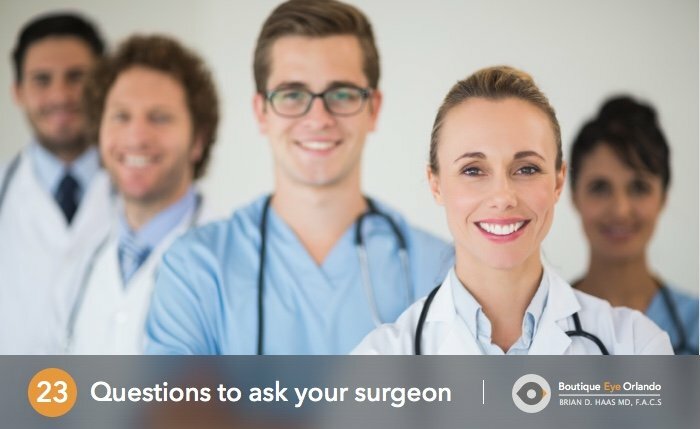 -Who can I contact if I have concerns after the procedure? -Can I see before and after pictures of previous patients of this procedure? -Can you provide patient references? -What is the cost for the procedure, and what do the costs consist of? Orlando’s Cosmetic Eye Surgeon Dr. Haas’s qualifications speak for themselves: he’s performed over 10,000 eyelid surgeries, over 5,000 cataract surgeries, and over 5,000 ophthalmic laser procedures. Have more questions? Just pick up the phone and call us at 407-841-1490, or make an appointment online and we’ll be happy to answer them.